I think this is among my favorites of the pictures you have posted. It's not the best or most interesting, probably, but I like it because it answers a question you would probably assume I'd have asked someone a long time ago: do deciduous trees lose their leaves everywhere? The obvious answer seems logical, but I always wondered...and it was one of those things I wondered about only when I was driving around or in some situation where I couldn't ask, then promptly forgot about until the next time it could baffle me. I had to really work with this location and this was the best I could get but I'm glad it did what I was trying to capture...which answer the question you and many have and ask. 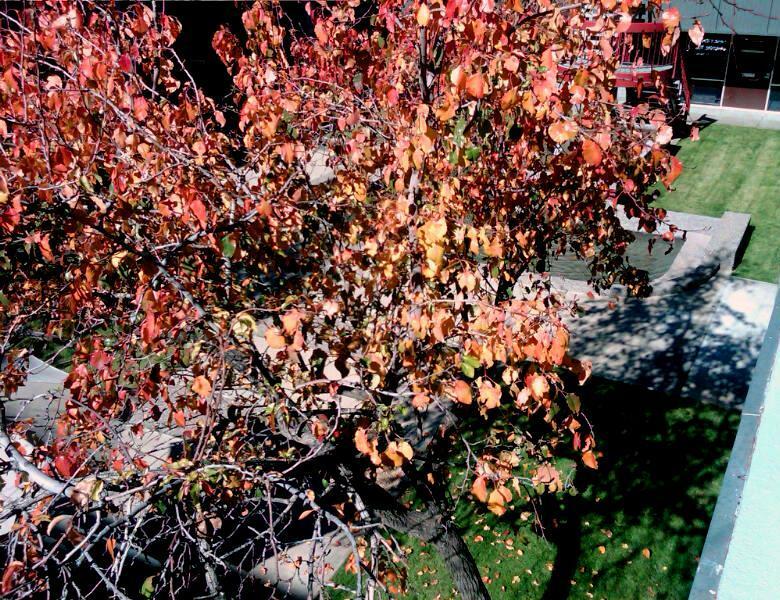 Deciduous trees have a delayed reaction to losing leaves in Phoenix and they different trees lose them at different times. Usually most lose them after Thanksgiving and before Christmas when we typically get the first very windy, rainy and cold storm blow in. Some trees hang onto their leaves, such as this one, and keep their "autumn" color until January/February, whether they're in a protected courtyard like this or not. These will drop by next week I bet and depending on the weather, the buds will appear around March/April.